Inventory We are a resale marketplace, not a box office or venue. Ticket prices may exceed face value. This site is not owned by Music Hall Fair Park . 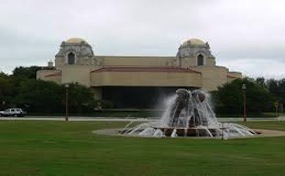 The Music Hall at Fair Park is a 3,420 seat performing arts facility in Dallas's Fair Park that opened on October 10, 1925. The building is of Spanish Baroque style with Moorish architectural influences, containing six stair towers capped with cast domes and arcade porches overlooking Fair Park. Air conditioning was added in 1954, and in 1972 the Hall was remodeled again with an expanded lobby and restaurant. In 1999 the theater was refurbished and updated. Because of the spacious nature of the Music Hall, the facility is a nationally recognized venue for Broadway musical touring companies and other large-scale public and private functions. The Music Hall is currently home to Dallas Summer Musicals and was home to the Dallas Opera from 1957 to 2009. FairParkBoxOffice.com is a privately held company that specializes in the sale of tickets in the secondary market. We are not affiliated with any official supplier or box office. To purchase tickets to any Dallas Music Hall at Fair Park events simply call our operators at anytime or click on the event you wish to attend.